In the late 90’s, Blizzard Entertainment was the most innovative game development studio with smash hits like Diablo and Warcraft. They were so successful, that Blizzard even produced toys based off their intellectual property, which was a really big deal back then, when most of the licensed toys you could find at stores were based on TV, film or comic books. 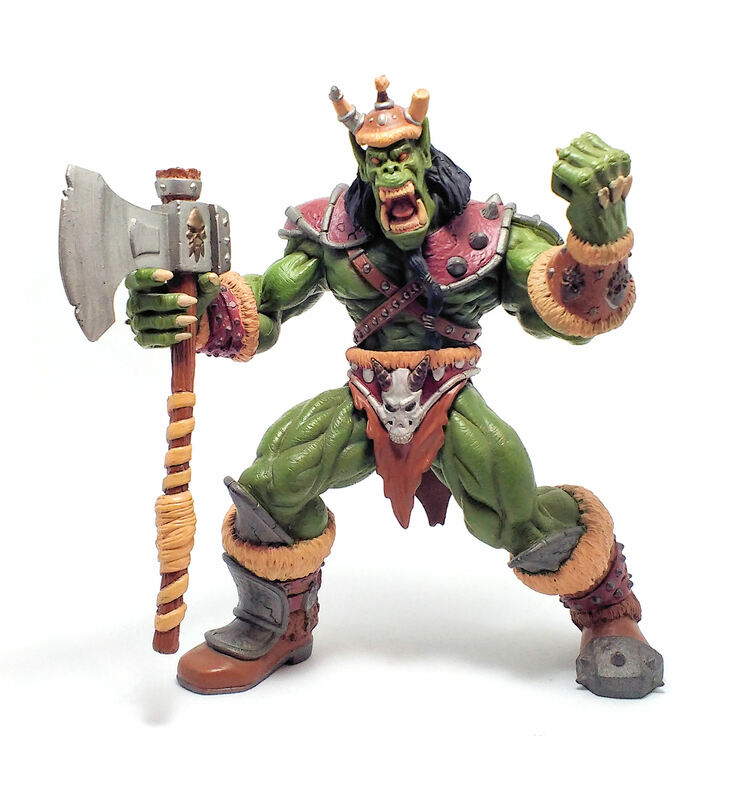 This Orc Grunt was released in 1998, as part of the first series of action figures based on the Warcraft universe. 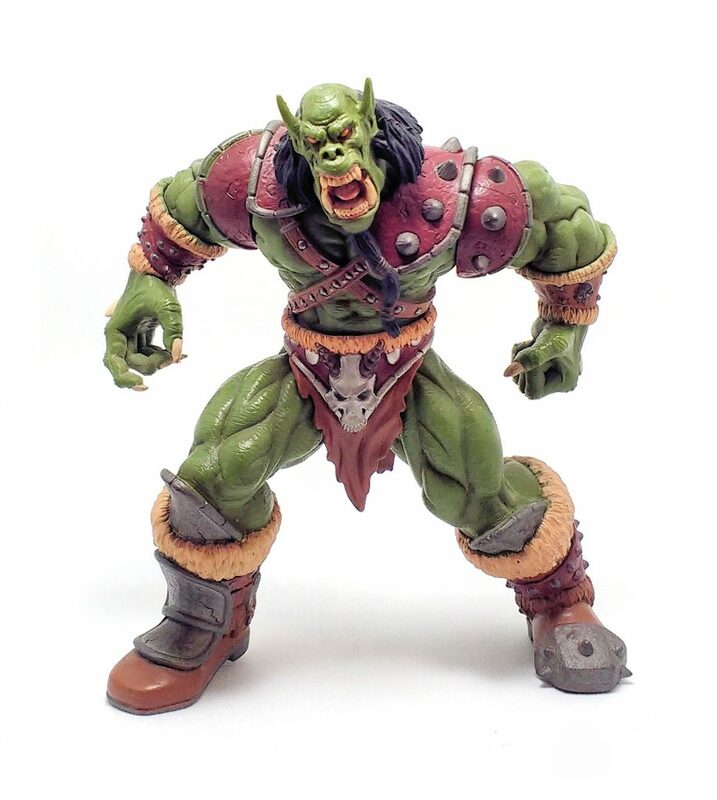 The sculpture is based more on conceptual sketches than actual digital models used for the RTS Warcraft game and it reflects a lot of the trends that were all the rage in action figure design at the time. 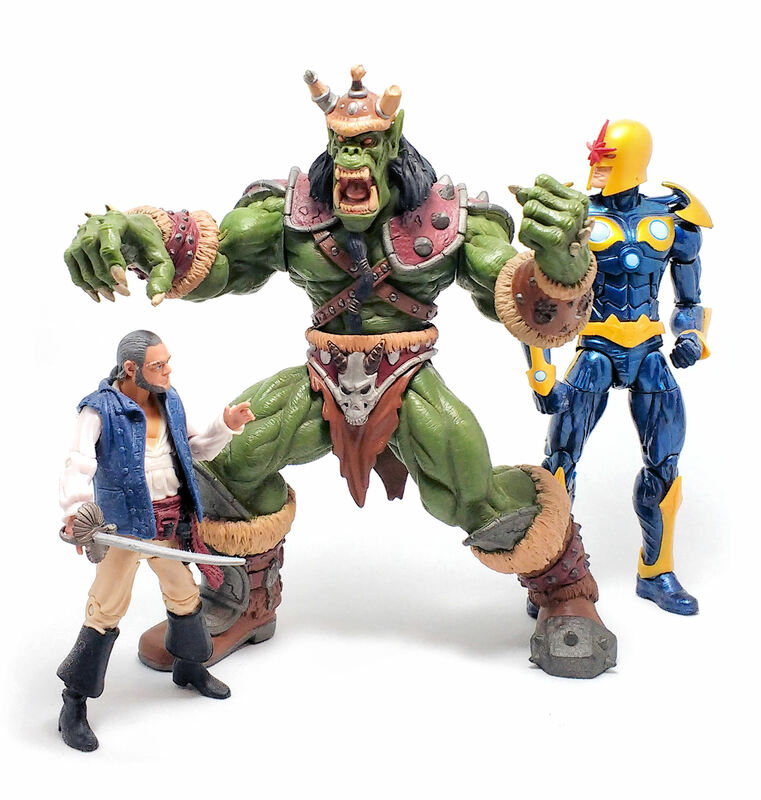 The Orc Grunt is a very large character, and the figure feel quite heavy and sturdy. 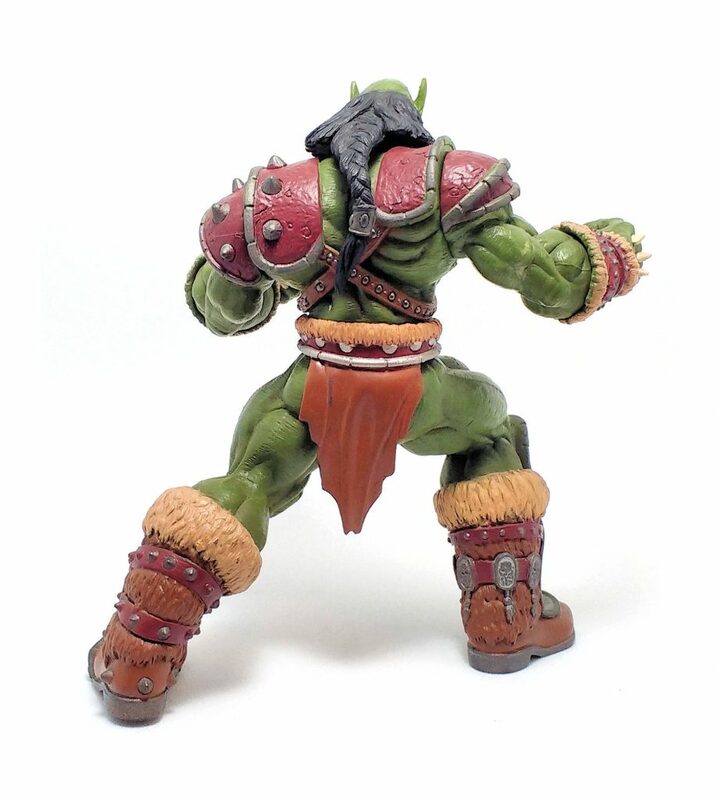 This Orc has bulging muscles and a lot of textures applied on every visible surface of the body and outfit. The Orc’s face was sculpted with a fearsome, raging expression showing the mouth wide open and full of teeth. You can see the tongue inside and the small, beady eyes sunken into the skull of the beast. 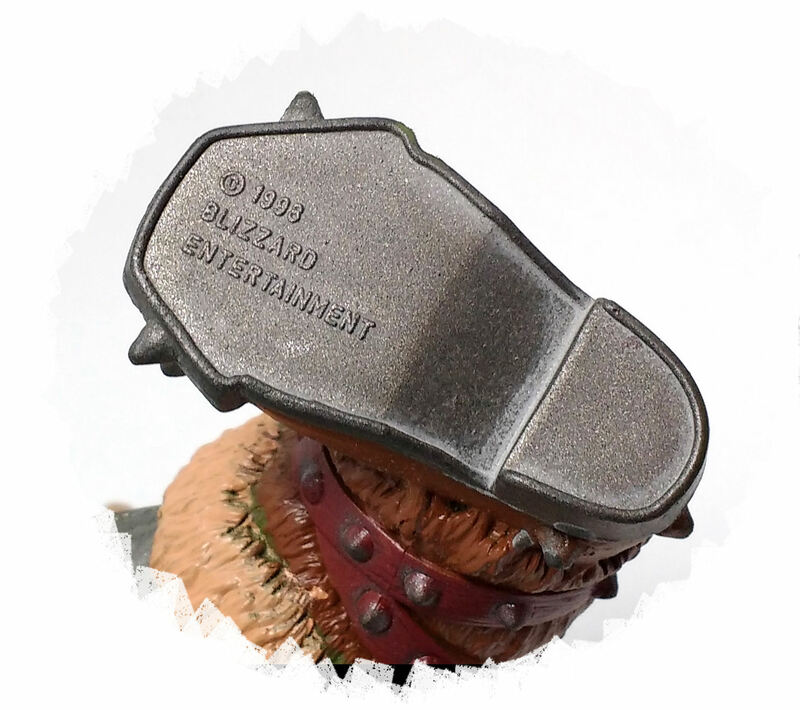 The Warcraft Orcs have a few distinguishing features that set them slightly apart from the way these creatures are portrayed in other fictional universes. They seem to be have facial hair and they seem to develop bone protrusions as they age, so this Grunt has a long mane of hair, a beard and bone spikes growing on the back of his hands. Articulation may seem rather basic, but take into account that this was the way figures were designed back then. On the bright side, the Orc is very stable and can remain standing without a problem even when wielding his gigantic weapon. The Grunt comes armed with a large battleaxe with a decorated axe head and a small horned helmet. These accessories are well decorated, but both pieces seem to have had a few design issues. First off, the helmet doesn’t really want to stay onto the Orc’s head. The skullcap is very shallow and barely hugs the curvature of the figure’s dome. The pointed ears seem to be the elements of the sculpture that do most of the work in keeping the helmet in place, but they will loosen their grip over time. 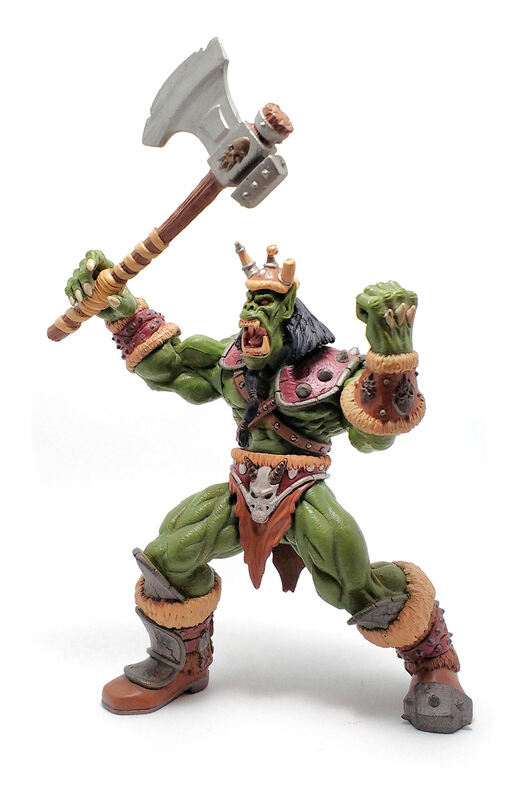 The battle-axe design appears to have been modified sometime before going into production by adding more bulk to the shaft so the Orc could actually grip the weapon with his right hand. Even though the solution works, I think there could have been more elegant ways to do it. I must say that this Orc Grunt has held up admirably well all these years since I purchased him, and thus remains prominently displayed on my videogame character shelf.